Home/ Store News/ Liquid-damaged MacBook Air CPU stops working- how to fix? Liquid-damaged MacBook Air CPU stops working- how to fix? A MacBook Air was damaged by liquid, the MacBook Air CPU stopped working, in resulting the MacBook Air won't turn on. The MacBook model is A1466, the motherboard model is 820-00165-A. Now we are going to fix it. First, test the MacBook Air. Press the MacBook power button, the MacBook Air didn't respond. Connect the MacBook to the external power supply, it doesn't charge. Now we are going to disassemble the MacBook. Use screwdriver to remove the screws that fix the MacBook Air rear case, and then remove the MacBook rear case. Disconnect the MacBook battery, supply power to it, the MacBook motherboard doesn't trigger, and there is the standby current, the MacBook power green light is also lit. Remove the MacBook motherboard, it's clearly see that the motherboard has the traces of the liquid. 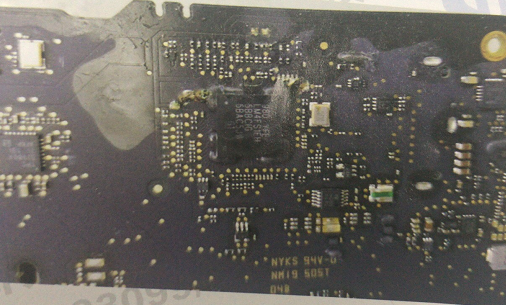 Check the front side of the MacBook Air motherboard, we can clearly see that the components next to the MacBook hard disk interface are severely damaged by liquids, there are many components are moldy. Now we are going to check the back side of the MacBook motherboard, it also was severely damaged by liquids, it's clearly see that there are many components next to the EC chip are moldy. We need to use PCB cleaner and iBrush DS1102 Brush to clean up the motherboard, cleaning all the moldy oxidized components, and then get the motherboard dry. After drying the motherboard is , use DC power supply to test the motherboard, now the MacBook motherboard triggers automatically, the current up to 0.45 and then stop moving. Use digital multimeter to measure the voltage for each inductor. Measuring the voltage for the U2071 4 Pin PLT_RST_BUF_L, the data measured is 3.3V, it's normal. The reset signal is normal, which mean the power supply, the clock and the reset for the motherboard all are normal. Next we need to measure the waveform of the LPC_AD to judge whether the CPU is working. After measurement, there is no waveform, only the voltage. Disconnect the power supply, use digital multimeter to measure the grounding resistance value for the LCP_AD, when measured the resistor R1540 1 Pin LPC_AD<0>, the resistance value is 30ohm, which is abnormal. 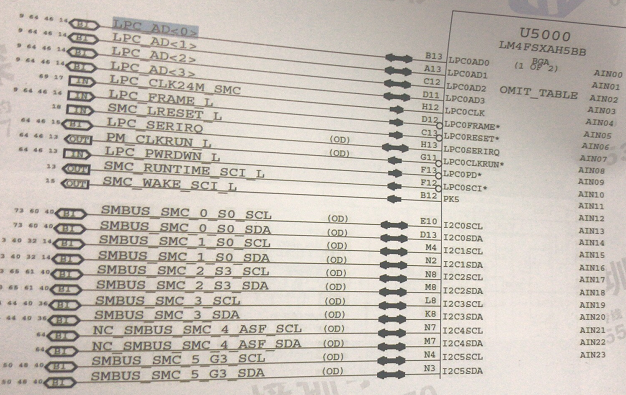 Measure the other resistors on the LPC_AD, the grounding resistance value is about 470ohm, all is normal. Remove the resistor R1540, the 1 Pin resistance value of the resistor is 28ohm, the 2 pin resistance value is 460ohm, which means it's 1 pin are pulling down the resistance. Login to ZXW online account to check MacBook schematic diagram, we can see that the resistor 1 Pin LPC_AD<0> is directly connect to U5000 EC. Directly remove the EC chip, it's obviously see that the chip is blackened. Replace the new EC chip, we need to disassemble the EC chip from the same motherboard model. After replacement, supply power to the motherboard, now the current jumps normally. Assemble the MacBook Air and test it, the MacBook is turned on successfully. After testing functions, the MacBook keyboard doesn't work, we confirmed it's damaged by liquid, directly replace the new keyboard, now the MacBook Air is working perfectly.